Lead occurs within the rocks of the North East of England because of geological processes. Uplift and the movement of faults cause the limestone beds to crack. Mineral rich hot water is injected from deep within the crust and mantle into cracks in the crustal rocks and in particular the limestone rock beds. As the water cools minerals are deposited in crystal form and galena (the mineral form of lead ore) is just one of many minerals to be deposited. Others include calcite, fluorspar, barites and pyrites. There is evidence of the use of lead in the Dales dating from the time of the Roman Emperor Trajan (117-138 CE) in the form of 'pigs' of lead (moulded blocks of lead) marked with the Emperor’s name. Much British lead was transported to Rome to be used in the water systems, roofing, paint and domestic goods (e.g. plates and cups). Demand for lead increased following the Norman Conquest through to the medieval period. Land was granted to aristocrats who had supported King William together with important mineral rights. Extraction was recorded by monastic estates who shared in the profits. Much of the Yorkshire Dales National Park was under the control of local monasteries such as the abbeys of Fountains, Rievaulx and Jervaulx and the priories at Bolton and Bridlington until the dissolution of the monasteries, under Henry VIII. In 1378 lead from Wensleydale was used to rebuild the gatehouse of Carlisle Castle. In the 15th Century lead was exported from Swaledale and Nidderdale via York to Antwerp, Bordeaux and Danzig. From c1540, following the break-up of monastic and crown estates, mines were leased to individuals. Lead was used in warfare, water pipes and glazed windows. 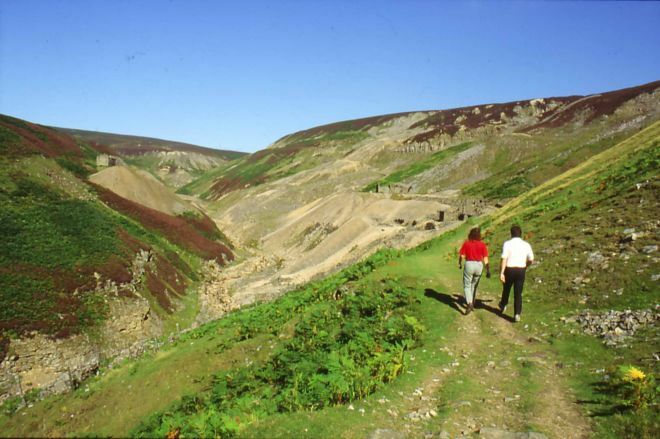 The Dales landscape was transformed by the growth in mining and smelting which also involved increasing drainage.